note: I originally shared this recipe on September 28th 2011. I have updated the images and some of the text today. After apple picking last weekend with our neighbors, I am left with a half bushel of apples and a whole load of recipes I want to make with them. 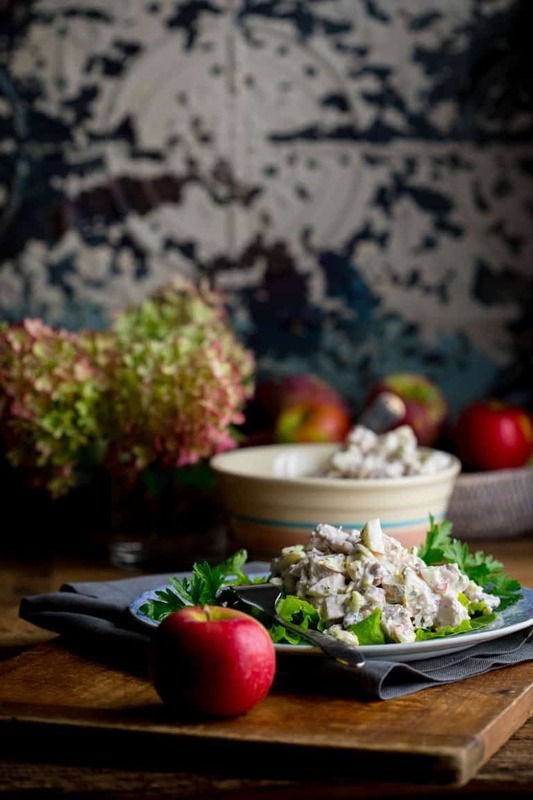 One of the top recipes on my list to make with the apples was this Healthy Waldorf Chicken Salad, which is one of my all time favorite recipes from the Best of Healthy Seasonal Recipes list. 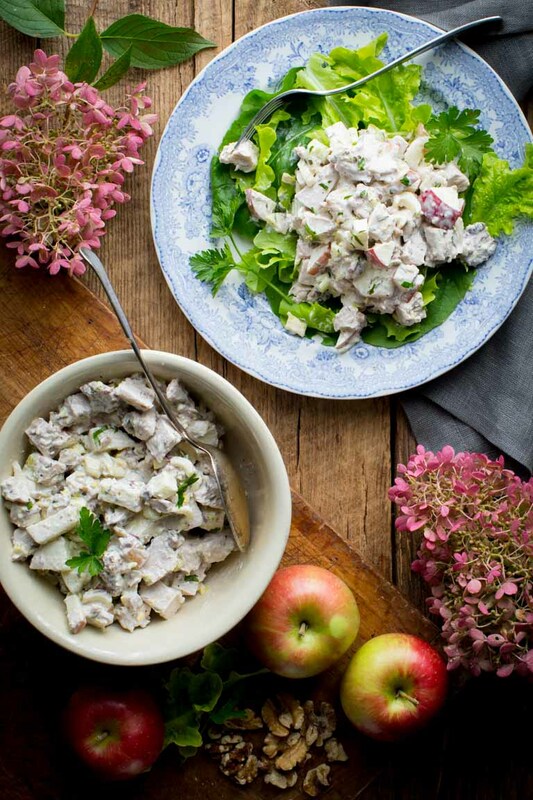 If you’re not familiar, Waldorf salad is a classic creamy salad of apples, celery and walnuts. It originated over a hundred years ago at the Waldorf Hotel in NYC. 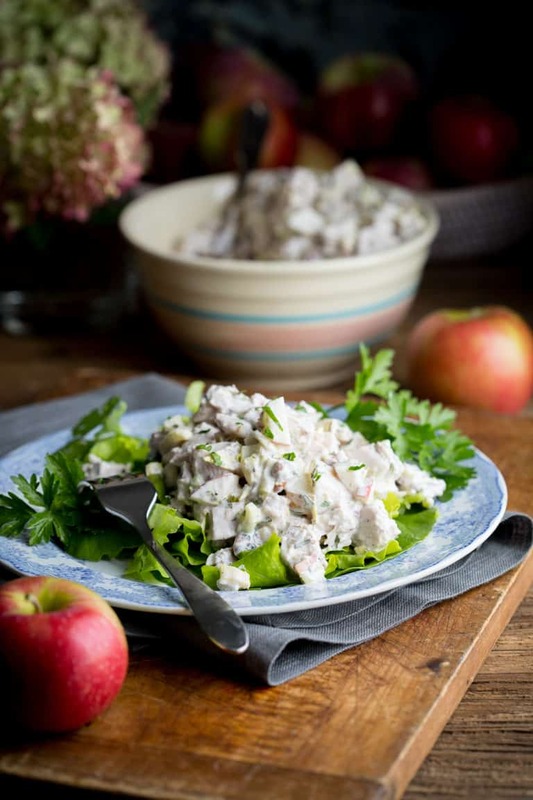 A lot of times you see variations with diced turkey or chicken added in with the apples and walnuts. Or you may see grapes added too. 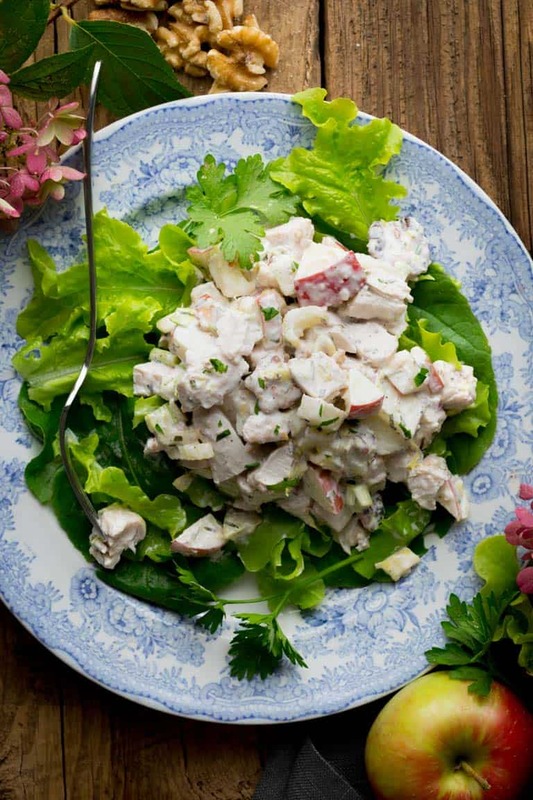 When I first came up with this recipe in 2011, I had decided to make a healthier Waldorf chicken salad inspired by my Gramma Ginger’s Waldorf Salad recipe. I remember her making it with loads of walnuts and apples with a fresh burst of tarragon. Unfortunately she was not much of a calorie counter and used a ton of mayonnaise to make it creamy. Not only that, but she served it on a split croissant! To make the chicken, you start with raw boneless skinless chicken breast. I find the easiest way to cook it is to poach it. If you happen to have left-over cooked chicken, that is totally fine. You will need about two medium chicken breasts. To make the dressing, whisk together some mayo for creaminess and classic flavor, but not too much since it is so high in calories. I found 1/3 cup is plenty. Then the rest is just fat-free Greek yogurt. That’s the base. Then add in the flavor boosts to the dressing: finely chopped shallot or red onion, garlic, white pepper, salt and the secret ingredient: tarragon. 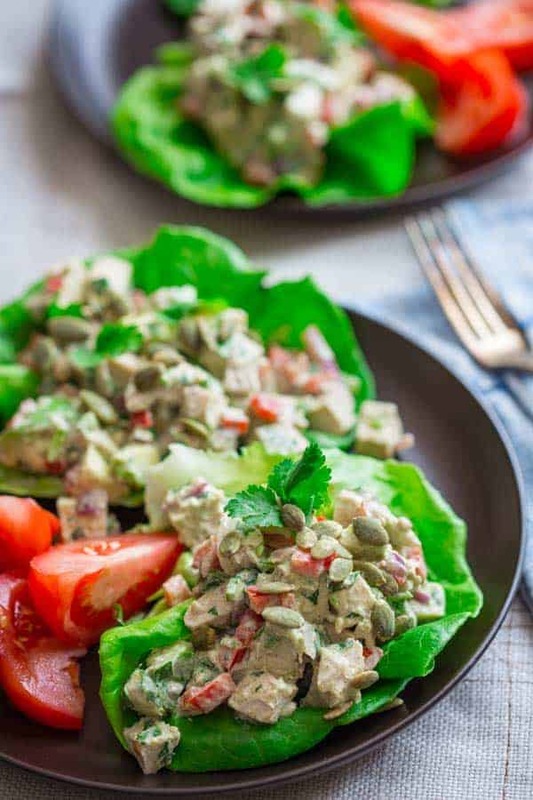 Tarragon is so good in creamy chicken salad and it is an ingredient my Grandmother always used. It is amazing. You’ll love it. It has a slight licorice flavor. Add all the crunchy things next: celery, apples and walnuts. Those are the three ingredients which all Waldorf salads require. Skip serving it on the croissant like my grandmother, and serve the Chicken Waldorf Salad over fresh greens for a light and easy lunch. The left-overs keep for up to three days in the fridge. Don’t miss this Ultimate Guide to Lettuce! Place chicken in a large saucepan and cover with water. Add a generous pinch of salt. Bring to a simmer over high heat. Reduce heat to medium-low and continue simmering until the chicken is no-longer pink in the center, 12 to 16 minutes (depending on thickness.) Transfer to a cutting board and cut into bite-sized cubes and let cool 10 minutes. When the chicken is cool, stir into the yogurt mixture. This is a classic and a keeper. Thank you for pinning! Thank you for giving us all hope! Hope that someday we, too, will be able to take a blog worthy photograph. Ugh! Good luck at the conference and thanks for this recipe. I’m going to share this with my Mom this weekend. Sounds delish! Thank you so much Karla, though not every blog has to be about the photography. Right? Thank you also for sharing this with your mom. Have a great weekend. I am looking forward to meeting you too Emily! It is going to be so fun! Ha ha. That isn’t true about my bad pic. Lol. I love the look of all these salads. I have never made a waldorf one as my husband doesn’t like walnuts but it certainly looks tasty and I like the use of the yoghurt to lighten out the mayonnaise. Does he like pecans? If so try it with them. Also pumpkin seeds would work well too, but use a half cup instead. I’ve been doing the happy dance at my house since Tuesday morning when my kids went back to school. Ahhh…the sound of…nothing!!! 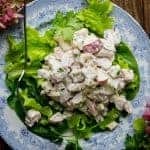 🙂 Love your salad Katie, and I’m going to add it to my weekly meal plan, since I get #nocomplaints from my family whenever I make chicken salad. Have a wonderful time presenting at Blog Brulee-wish I could be there to see your presentation! It is bitter sweet. I miss them, but I am so frazzled at this point, it is great to get back to work. It’s amazing to put photos side by side and really compare how far we’ve all come! 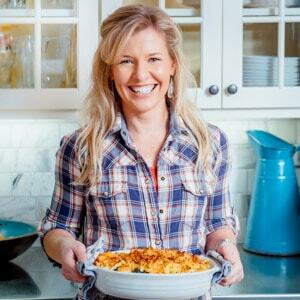 I have similar recipes that I doubt anyone has tried because they’re old and not styled well. I can’t wait to hear your presentation at Blog Brûlée in a few weeks and get to take advantage of the ability to be in one room with so many wonderful faces! I think everyone agrees that it was fun laughing about my earlier photos. It gives everyone some perspective! Great to meet you at Blog Brulee. I am looking forward to meeting you Marisa. And all the other people whom I’ve gotten to know online for so long now. We will have a blast! It has been ages since I last had my waldorf salad. I love that open sandwich too. I do love an open sandwich but the photo has to go. ha ha! 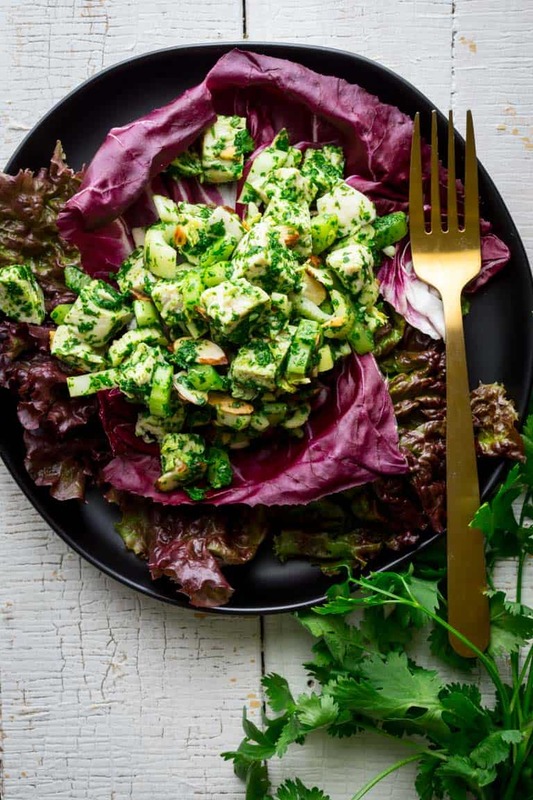 I looove that you’ve added tarragon to this yummy salad! It’s one of my favorite herbs and so under-utilized. Looks delicious! I agree about Tarragon. I think it’s the slight licorice flavor that sets it apart. 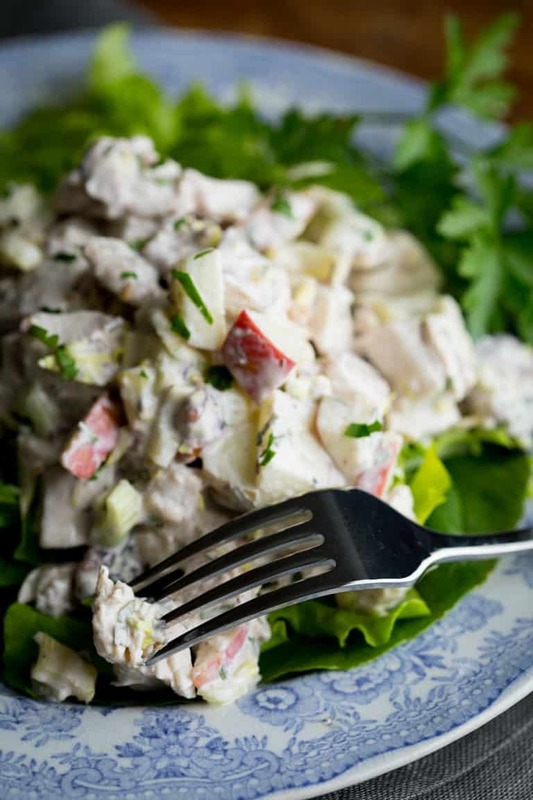 Chicken salad is one of my favorite lunch treats but a few years back I tried Waldorf salad for the first time and I’m hooked! Love this in a lettuce wrap. This would make such a delicious lunch! It’s a real treat to have a bowl of this on hand for lunches. It really fills me up, and yet it’s less than 300 cal! Thanks Gerry and for rating too! I appreciate it. Hope you’re well! 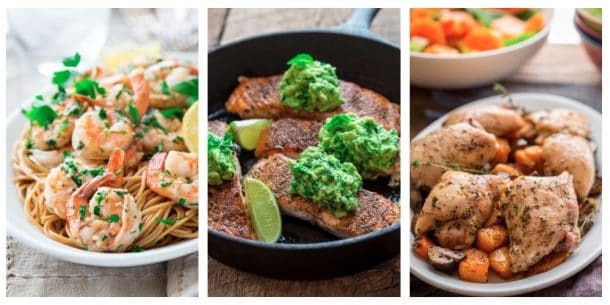 This is perfect for lunch meal prep for the week! Love the textures and flavors – looks delicious! It’s totally great for meal prep because it stores well in the fridge. Serving these taco style in a lettuce leaf is a great idea! Chicken salad is my favorite.